Should You Buy a Coastal Property? People often consider moving to the seaside. Living on the coast is a great prospect for anyone who likes the sound of the waves, the smell of the sea or the sunshine that some areas receive. However, there can be downsides to living so close to the water. If you want to own a coastal property, you can be somewhere remote, or you can choose a more populated home. Whichever one you want, you can face a number of issues that might put you off living by the sea. If you’re considering moving to a seaside home, you should think about some of these pros and cons first. Before you buy a home on the water, there are a few environmental issues to consider. Not all “seaside homes” are right on the coast. However, some of them are, and they can face issues. These properties can become victims of eroding coastline and rising water levels. Anyone who chooses to live in them needs to be aware of this and what they need to do to combat the problems. For example, many homeowners have to look into buying bulkhead material to protect their property from the water. In some locations, it would be unwise to purchase a home that could soon collapse into the sea. The costs of owning a home and living on the coast can vary. It’s more expensive in some locations and cheaper than others. However, no matter where you live, it’s likely to be more expensive than living inland. If you want to buy a coastal home, it’s not just the price of the property you need to consider. There are other factors too, from energy providers to even the cost of food and drink. If you choose to live somewhere more remote, especially in a desirable location, you can find the cost of living is much higher. One of the bonuses of living by the sea is the health benefits it offers. In fact, some of the locations where people live longest are islands and coastal areas. There are several theories about why this might be, including the diet these people enjoy. Whatever the reasons, there is evidence that coastal living can be good for you. The air is often fresh and clean, and you have plenty of outdoor space to explore. If you’re looking for somewhere that allows you to live an active life, being by the sea will help you do that. If you want to buy a coastal property, it helps to consider the costs of maintaining it. You need to think about the weather when you’re living by the sea. Wind and rain can batter your property and cause at lease cosmetic damage. However, caring for your home won’t necessarily be more expensive than living elsewhere. You may just have to approach it in a different way. Owning a coastal property can give you beautiful views and a sedate lifestyle. But don’t forget to think about the other issues you could face. There is something about eating outdoors that is elemental. Maybe the aroma of cooking on the breeze stirs something up inside us. Whatever it is, it works. Al Fresco dining is as good as it gets. It whets our appetites and makes us more social. Outside there are no distractions. We focus on the food and the company and let’s face it, life does not get any better than that. But rolling the BBQ out of the garage does not quite give us the ambience we need. How can you plan your garden around your outdoor kitchen and really make the most of your alfresco dining experience? Another slightly more adventurous scenario would be to create a purpose built area in another part of the garden. This might need to be protected to some degree from prevailing winds and breezes. But this might be a lovely idea especially if you have a place in the country. It could also be a way to take advantage of a special view, or a place to eat while you watched the sunset. Wherever you decide work, you’ll be able to focus on a dedicated area. In doing that you can take advantage of the experience of a company such as TDL who are experts in landscaping. You’ll need a base and have to think about your flooring options. Something solid with character that is easy to keep clean would be ideal. 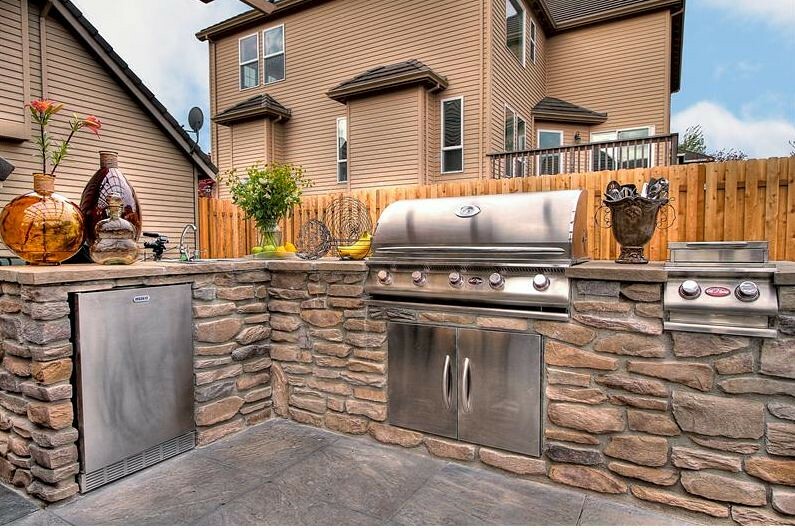 It’s great to have at least one wall or half wall to place your oven or BBQ area up against. Here you can think about other attractions such as a fire pit or even an outdoor fireplace to keep you nice and warm. This could make even dining out on cooler nights a heartwarming option. If this is a kitchen away from a kitchen, it can be a good idea to think about food preparation areas, as well as having running water and a sink. This will be useful in terms of preparing food. There are a wide range of screens and ways of protecting yourself from not just cooler breezes but also insects on warmer nights. Have a think too about the kind of feel that you would like. Outdoor furniture is an important aspect of your whole experience. You could focus on a table and chairs or draw in a few loungers for more relaxing options. The outdoors cook might like to take advantage of the living garden. What could be fresher and more nutritious than being able to bring your own salad and vegetables to the table? A herb garden is a handy and aromatic choice to have close by. Companion planting with lavender helps keep the bugs at bay. All you need now is for the sun to go down and a few lights to come on. As the soft glow of the candles work their magic, it is easy to anticipate the feast ahead. When you move into your new country home, we’re sure you’ll be thrilled with the interior. But, there might be a quite a lot of work to do in the garden. Particularly, if you’ve bought a home with a lot of land. It’s true to say that you could have your work cut out for you. So, it’s important to know how to manage a big country garden. As well as this, we’re going to recommend some of the improvements that you could make. It’s possible that you may want to complete some landscaping work in your new garden. This is quite similar to a home renovation. It takes a lot of work to completely change the way a garden looks. For instance, through landscaping, you can add a slope to your garden. Or, you can flatten it down completely. Adding a slope away from the home is useful if you think you have bought a house in an area that could flood. To do this, it’s best to hire the proper equipment. A landscaping job of this size will involve the movement of quite a lot of soil and other materials. A bobcat hire service is perfect for this. You’ll be able to move the material you need to effortlessly without any trouble at all. To make a garden look attractive, you need to start by keeping it neat and tidy. As we have already said, you may have bought a home with a large plot of land. If you have, it can seem impossible trying to keep the grass short and neat. You could hire a gardener to come in each month and sort it out for you. Or, you may want to complete the job yourself. It’s easy if you have a petrol lawnmower. Driving one of these around your garden will make cutting the grass a cinch. Of course, there’s more to a beautiful garden than just neatly cut grass. You may also want to add some flowers around the yard. We suggest you try to pick some flowers that are a little unique but still match the aesthetic of the home. You don’t want them to stand out too much. But you do want to add a variety of colour to the scene. Just because you’ve bought a home in the garden, it doesn’t mean that you have got a large plot of land. It could be quite small, and you may want to use the space the best that you can. You can separate it by laying down some patio if you have a large stretch of green. That way, the garden will look bigger, and you will have different areas to use and design. For instance, on the patio, you might want to lay out a seating area. Of course, one of the best things about being out in the country is that you’re going to have quality soil. You can use this to grow your fruit and veg living off the land. Have a look at our tips to do this and you’ll soon get the hang of it. We hope you find these tips useful. Make the most of your garden and check back soon for more advice. We love our dogs and we wouldn’t be without them. Sometimes though a dog that has been raised in the city takes a bit of adjustment when it comes to the country. A bit like us really. You tend to want to run round a lot and let off some steam! Being in country is great but there are some things we need to do to make sure the dogs are safe. The same probably applies to livestock.You have to respect the people who have been here for generations. You want to get on with the neighbours. More than anything you want to give your dog the great life he or she deserves with all the freedom that entails. Get out there and meet the neighbours. It’s a matter of courtesy really, but you might make it a point. Introduce yourself as the new dogs in town so to speak. That way everyone can start to get used to seeing you around and more importantly your dog can get used to meeting the others dogs around the place. The freedom of living in the country is tempered by some of the possible dangers and limitations. Our dog wouldn’t go running around the town without a lead, and he certainly won’t be doing that here. We have a great garden, and I want us all to be able to enjoy it and that includes the dog. You might consider running up some fencing to make sure the space he is in is safe and enclosed. That also means I can fence off any areas of water that might prove to be a problem. We’ll be planting here eventually but right now I’m on a bit of a weed-killing spree. I need a dog friendly weed killer and that is exactly what I’ve been laying down and I‘m thrilled with it. If you have the luxury of a spare downstairs room you could let the dog in there with no worries, and that’s fine sometimes. I’ve alway had an idea that the dog would get his own house! There are plenty of kennel kits out there. I think that it would be great for him to have a space to call his own! Probably the biggest worry for a dog owner in the country is the animals and in particular the stock. It’s one thing to have him tearing off after a rabbit but quite another to think that he’d see sheep in the same vein. Take a look around and get your dog into a training class. The best way to deal with the possibility is of course to get him used to walking around the animals and coming to heel when you call. The rest of the time he’ll be on the lead. It’s just reassuring to think that he’ll be able to settle into his new home with no worries. I’m sure he’ll soon be walking around like he owns the place.